The Hanle effect, first thoroughly measured and documented by Wilhelm Hanle in 1922, is, along with the original Franck-Hertz experiment, one of the founding experiments of quantum mechanics that is also based on the 1S0–3P1 mercury transition at 253.7 nm. It concerns the observation that the polarization and intensity of resonance fluorescence light is affected by a weak magnetic field (a few gauss). In the quantum mechanical explanation of the effect, at zero field a linearly polarized photon can excite both positive and negative helicity transitions coherently, but when the field is non-zero, the degeneracy is lifted and the coherent excitations will depend on the natural line widths of the two substates; the overlap of the substate resonances can be controlled by the field, and the result is a direct relationship between the fluorescent intensity and the deviation from zero field. By sweeping the field while measuring the intensity, one obtains a measurement of the natural line width, and thus lifetime of the 3P1 state. Such an experiment is an example of “level-crossing spectroscopy,” although the levels in this case are degenerate at zero field. Remarkably, Hanle derived a wholly classical theory that gives essentially the same result as the quantum explanation, based on a model of damped oscillations, wherein the damping constant is the excited state lifetime. The Hanle effect is also one of the first Doppler free measurements of an atomic state lifetime. In this Immersion, participants will learn how to set up and carry out measurements of fluorescent mercury light subject to varying magnetic field and varying incident light polarization. They will use this data to determine the lifetime of the 3P1 excited state, and consider effects of corrections to the measurements based on finite vapor pressure of the Hg vapor. They will also study the effects of Earth’s field on the measurements, and how to minimize these with a “bucking” coil. A review of Hanle’s classical model of the effect will be presented, along with a more modern quantum-mechanical treatment. The heart of the apparatus is the mercury absorption cell placed inside a light-tight cavity at the center of a large pair of Helmholtz coils. A larger “bucking” coil also surrounds the cavity and is used to null the local Earth’s field. A horizontal tube extends from the cavity back to a mercury UV lamp. A UV polarizer is placed between the lamp and the tube entrance. Another, longer, vertical tube extends from the top of the cavity and it is topped with a UV-passing filter and photomultiplier detector (PMT). The length of the input and output tubes ensures a narrow angular deviation from 90 degrees between the incoming and re-radiated mercury light. The PMT is energized by a 1000V DC supply, and the signal from the PMT is first amplified by a fast pulse amplifier and then converted to a well-defined train of logic pulses by a discriminator and gate generator. The pulses are counted by a Norland 5500 multichannel analyzer operated in the multichannel scaling mode. In this mode, each channel represents the number of counts in a successive fixed time interval, with 1024 channels comprising one sweep. The start of each sweep is synchronized with a ramp generator and amplifier that is used to drive the Helmholtz coils. Thus, the data set gives the number of light pulses measured as a function of magnetic field, for a given incident light polarization. In one polarization setting, the signal shows no magnetic field dependence. In the other setting, there are two absorption peaks centered on B = 0 whose widths are inversely proportional to the excited state lifetime. The Hanle effect, and level-crossing spectroscopy in general is not nearly as well-known as other early quantum experiments. But the experiment nicely demonstrates a number of important concepts: Zeeman splitting of atomic levels, natural line width, the relationship between selection rules and polarization states, the problems of pressure and Doppler broadening. In addition, Hanle’s classical explanation of the effect reinforces the classical models of absorption and radiation, polarization rotation in a B-field, and basic resonance physics. In terms of techniques, participants will learn about multichannel scaling, operation of PMTs and counting, and manipulating magnetic fields with Helmholtz coils. They will also deal with the problem of calibration: converting the channel numbers to magnetic field values. Looking inside the absorption cavity; construction of the mercury cell. Setting up the coil set and orienting the apparatus. 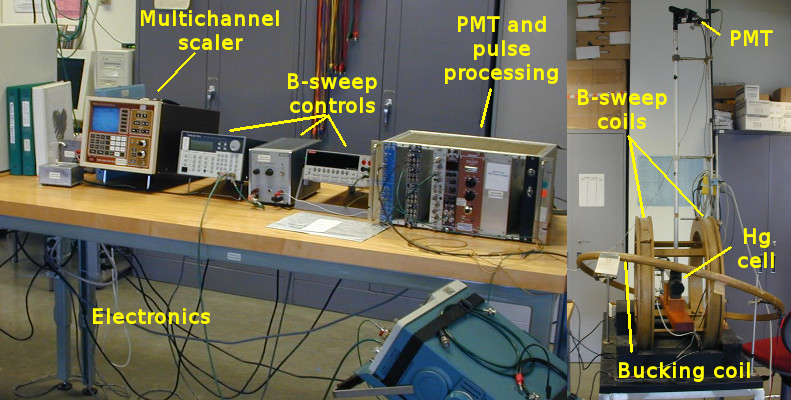 The electronics and magnetic field sweep. Choosing the parameters. Observing the fluorescence signal and its polarization dependence. Processing the signal—setting the discriminator. First data: scans with two polarizations. Lecture/discussion: The quantum mechanical treatment using the Breit equation. What we actually measure. Pressure broadening corrections. Further experiment: Exploring the bucking coil effects; comparing peaks with the coil on or off. How to determine optimum setting of the coil current. Lecture/discussion: Implementation challenges: mercury cell, large Helmholtz coils; options for multichannel scaling and pulse processing. Extensions to the setup: Analyzing output polarization. Varying Hg cell temperature. There are a few hazards in this experiment: a high-voltage power supply with PMT. UV radiation from Hg lamp. Instruction will be provided concerning these risks. Cost estimate: A few essential components were custom built, and as such only estimates may be given for their cost. The Helmholtz coils and bucking coil are very old, left over from research long ago. Many of the commercial components we use are no longer sold, so the list below only estimates a replacement cost.